After hearing about the supposed strong sales of THE ESTUARY over the private preview last week, the wife and I decided to drop by the sales gallery last evening to check the project out. As construction of THE ESTUARY is already in progress, the sales gallery/showflats is located at a vacant plot adjacent to the actual site. We were met by a sea of people on arrival – a mix bag of potential buyers, curious onlookers (like yours truly) and marketing agents – despite the fact that it was already way after 5pm. We were later told that yesteray was the first day of the official launch of this project. THE ESTUARY is a 608-unit mass market project developed by MCL Land, who is also the developer responsible for projects like The Esta, Hillcrest Villas, Waterfall Gardens and not forgetting our favorite (still) – Parvis. This 99-years Leasehold condo is made up of 7 blocks of between 15 to 17-storeys, and is sited on about 209,000sqft of land – supposedly the largest private residential plot in the Yishun area – at the junction of Yishun Ave 1 and 2. The expected TOP of THE ESTUARY is by mid-2013. 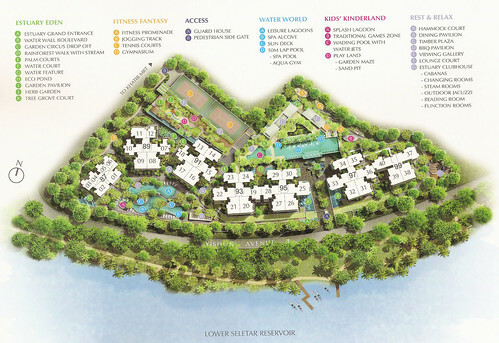 THE ESTUARY is marketed as a “waterfront living” project, as it is fronted by the Lower Seletar Reservoir. And since the condo is built on elevated ground, it provides residents with unobstructed reservoir view. THE ESTUARY is supposedly about 8-mins walk away from Khatib MRT Station, and also within a few minutes drive from North Point (amenities, shopping & dining) and the Orchid Golf and Country Club. There are “bigger unit” of the various apartment types available, but the additional area is only a reflection of the size of the PES/open terraces. The facilities at THE ESTUARY are very extensive, as you can see from the site-plan below. But what is most noteworthy is that the roof top of the multi-storey carpark (3-levels, located at the back of the development) actually houses the gym, club house, BBQ area and the 50m lap-pool/spa pool/aqua-gym. And bucking the trend of "no tennis court" in many new projects these days, THE ESTUARY actually has TWO tennis courts. But the wife and I reckon that it is far easier to be generous on facilities when you are sitting on such a big piece of real estate. For parking, a total of 632 carpark lots will be provided for the 608 units – again rather generous compared with many other new projects. There are 3 types of showflat on display at the sales gallery. 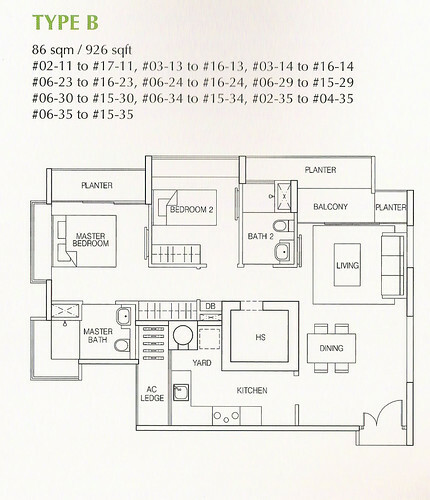 The first is a 1528sqft, 4-Bedroom unit (Type D). As you walk through the main door, a short walkway leads you into the rectangular-shaped living/dining area. The area comes with 60cm x 60cm homogenous tiles flooring and 2.75m height ceiling, and looked rather cramp even with just a small sofa & 6-seater dining table. The balcony/planter area is huge, lining all the way from the living room to the adjacent common room and then the master bedroom beyond that. We were told that the large balcony is a feature of all the bigger (i.e. 3 and 4-bedders) units in THE ESTUARY, as this allows residents to maximize their view of the reservoir from their balconies. The kitchen is quite good size and comes with “Ariston” hob/hood/oven, “Hansgrohe” faucets and top & bottom set of kitchen cabinets with anti-slam drawers. We were not particularly impressed with the look of the appliances/furnishing provided. A small yard is found at the end of the kitchen, with probably enough space for the washing machine and no much else – so you can probably forget about hanging and ironing of laundry here. The home shelter may not allow you to fit a standard single-bed if you intend to use it as the maid’s room, but she will at least have her own bathroom to wash up. The common bath has homogenous tiles for floor and walls, and comes with a standing shower stall with wall mounted “hand-shower”. You also get “Hansgrohe” and “Duravit” bathroom/toilet fittings. All three common bedrooms are regular shaped but rather small. This is especially with the one that is adjacent to the living room, which is probably more suited to be used as a study rather than a bedroom. And occupants of the three common bedrooms will have to share the same common bathroom. The “small” theme extends to the master bedroom - you have hardly any space left for additional furniture after fitting in your “Queen” bed. But you can walk out to the balcony area to enjoy the view directly from here. The master bathroom is quite decent size, and comes with “His” and “Her” bathroom sinks (so no fighting over who gets to brush teeth first in the morning). It comes with homogenous tiles for walls/floor, “Hangrohe/Duravit” fittings and bay windows that line the walls behind the sink and long bath area. A separate standing shower stall is next to the long bath, and come fitted with wall mounted “rain-shower” – i.e. the shower head sticks out from the wall rather than from the ceiling. And just like the kitchen, the wife and I are hardly impressed by the quality of furnishings and fittings provided in all the bedrooms and bathrooms. The bathroom sinks in particular are rather "Budget” looking (no offence). For the sake of simplicity, we like to highlight that the furnishings and fittings for the other 2 showflats are identical to the 4-Bedroom showflat. So we are just going to commend on the layouts. 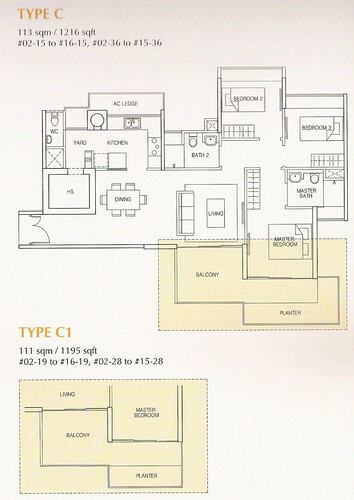 The next showflat is a 1216sqft, 3-Bedroom unit (Type C). The layout is quite similar to the 4-bedder – you get an even smaller rectangular shaped living/dining area and a square-shaped balcony. The master bedroom is adjacent to the living room, while the living room balcony actually extends to the rectangular balcony/planter area outside the master bedroom (see floor plan). The whole balcony/planter area is far too big if you ask us, especially in relation to the small living/dining area. The rectangular-shaped kitchen is quite decent size, but there is little to no yard space to work with. It will be a challenge just to fit a washing machine in this yard. The home shelter/bathroom is about the same size as the 4-bedder showflat. The common bath is fairly good size, while the two common rooms and master bedroom are again rather small. So while it will be relatively easy for you to outfit the bedrooms due to their regular shape, there will however not be much “room” to outfit. The master bathroom is rather compact, and comes with a single bathroom sink and standing shower stall only (no long bath). 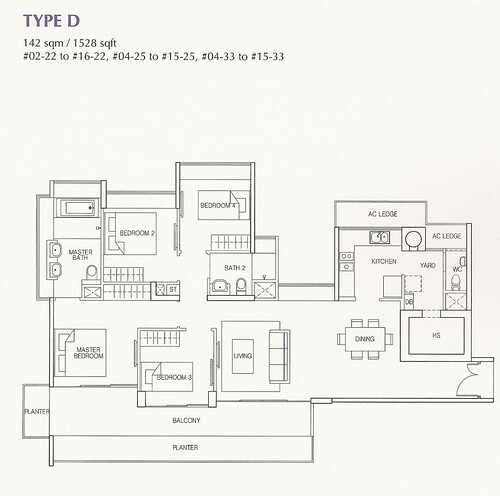 The last showflat is a 926sqft, 2-Bedroom unit (Type B). The layout in this unit is quite different from the other two (understandably with the size) – a small rectangular living/dining area, a balcony/planter area that is probably too extravagant for a unit of this size, a small rectangular strip of a kitchen with just enough “yard” space to house a washing machine, a home shelter located in the living area opposite to the common bathroom and a small but regular-shaped common room. However, the wife and I were pleasantly surprised by the size of the master bedroom, which actually felt bigger than the one in the 3-bedder showflat. The master bathroom is also rather generous in size for a 926sqft unit. • The reservoir view is really quite pleasant – the developer has deliberately built the showflats on the second level of the sales gallery with full height glass windows looking out towards the reservoir. So you can imagine what the view is like if you have a reservoir facing unit on, say, the 10th floor. • Kathib MRT Station is about 8-mins walk away, and it is about a 20-mins ride from here to Orchard and about half an hour to the CBD (we think, since we hardly use the MRT). This should be a good enough reason to ditch the car and save you from the hassle of traveling up/down the CTE especially during rush hours. The wife and I were told that traffic situation at the CTE is no longer that bad, but our experiences in using this expressway have been more bad than good thus far. • The internal living area of the 3 and 4-Bedroom units are too small for our comfort. Given the large balcony/planter area for these layouts, something has to give. But not many of us can sit in the balcony and stare at the reservoir throughout the day, especially when it rains. • The quality of furnishings and fittings has left relatively little to be desired. Maybe this is the current standard for mass market projects (see our review for WATERFRONT KEY), but it is still quite difficult for the wife and I to come to terms with the fact that THIS is what you can only expect to get for an apartment costing slightly more than a million dollars these days. • Having a large balcony for residents to enjoy the reservoir view is a good idea, BUT having a large balcony with little or no yard space is not. You will probably end up with owners hanging their laundries out to dry at the balcony, which calls for an ugly sight as you drive past the condo. For an idea of what we are talking about, just drive along Ulu Pandan Road and slow down as you hit Pandan Valley. • We can only find just one primary school that is within 1-km of THE ESTUARY - Pei Yang Primary. The consolation is that it is co-ed, so equal opportunity for parents with son or daughter. As of last evening, more than 480 units at THE ESTUARY have already been sold. The take-up rate is quite astonishing, as the project only started previewing last week and yesterday was the first day of official launch. And for those eyeing the 4-Bedroom units, you be disappointed to know that they are all sold out. Price wise, a 1302sqft, 3-bedder (#13-16) will cost you $1,039,500. This equates to about $798psf. In comparison, recent transactions for similar size units at the 99-years leasehold Orchid Park Condo (just down the road from THE ESTUARY) were done at price range of $502 – $564psf. One can argue that Orchid Park is about 16 years old, while THE ESTUARY is brand new and much nearer to the MRT. But we will let you decide on which is a better deal. In summary, the wife and I feel that THE ESTUARY will probably be popular with HDB upgraders living around the Yishun area. This looked to be the case judging from the crowd we saw at the sales gallery yesterday. There seems to be a genuine fear among HDB upgraders/first time buyers that they will miss the boat if they do not put money on a private property now, given the phenomenal increase in property prices during the past year. But to pay $800 - $900psf for an apartment in Yishun? The judgment is probably still out on whether this is a good call, but the wife and I will not wager on it. 1 comment to ''THE ESTUARY (Review)"
Shoutout to the residents of The Estuary Condominium @ Yishun! You can now join our exclusive Facebook Group! We will be sharing 3D design concepts and we will post exclusive promos and offers just for you!